Crossed Roller Slewing Bearing manufacturers, Crossed Roller Slewing Bearing exporters, Crossed Roller Slewing Bearing suppliers, Crossed Roller Slewing Bearing OEM service. Slewing Bearing can accommodate axial, radial and moment loads acting single or in combination and in any direction. They are not mounted in a housing or on a shaft, but directly to a seating surface. The inner and outer ring are supplied with mounting holes. Both rings may have integral gears. They are also referred to as slewing rings and tabletop bearings. 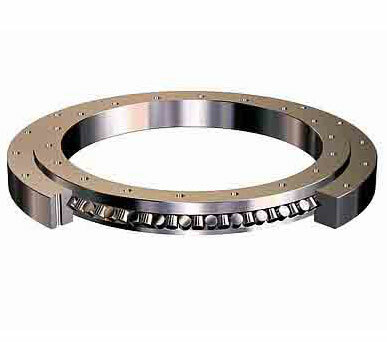 Slewing ring bearing can perform oscillating (slewing) as well as rotating movements. They may be used without gears or with internal or external gears. Slewing ring bearings can take moment load and radial load, besides take thrust loads; There are ball bearing, roller bearing and ball-roller bearing at type; There are single-row, double-row and three-row at structure. With teeth and without teeth on conduction(outer or inner ring); At dustproof and leak grease proof type, with airproof and without airproof. At mounting with flanged(outer or inner ring), with bolt hole and without flanged.